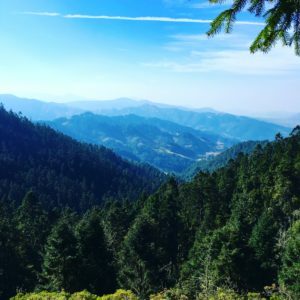 Our second adventure was to the Sierra Chincua monarch sanctuary. 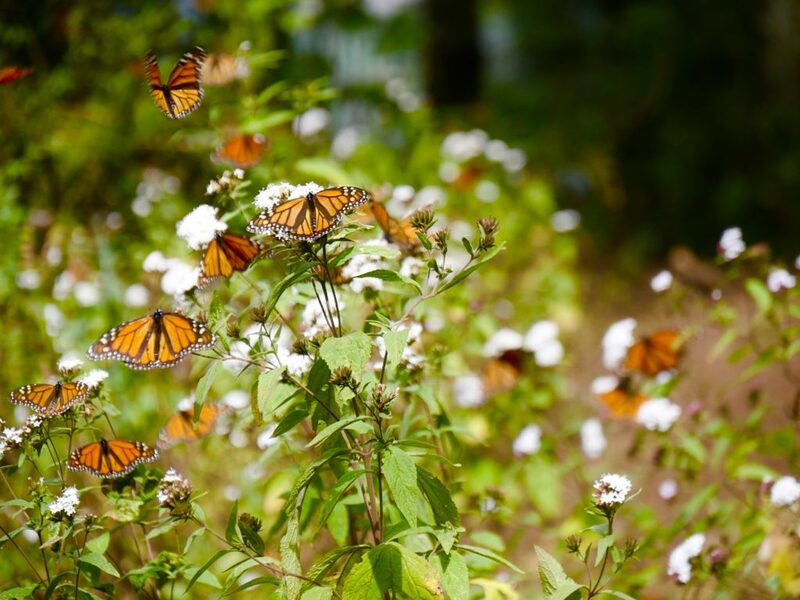 Sierra Chincua Monarch Santuary is located even at an even higher elevation than El Rosario. Folks, if you make this trip, make sure to give yourselves time to acclimate, altitude sickness is no joke, let me tell you! The hike to the monarchs was GORGEOUS! This was a much different experience than El Rosario. El Rosario was more ‘user friendly’ and had much easier access, there were stairs leading to the monarchs and well groomed trails. At el Chincua, the trek to the monarchs took about 45 minutes to an hour (horses were also available). 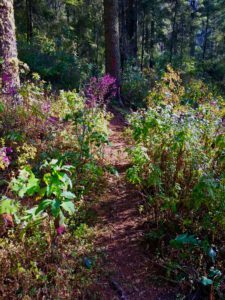 The trail wove through the woods and was bordered by purple, pink and white wildflowers, and at one point it led us to another cliff side trail that overlooked a stunning valley. The monarchs were much more active during our hike, we started seeing them flitting through the trees very early on. The monarchs were moving quite a bit, they will move from higher elevations to lower as the day warms. This particular day, they moved to a part of the forest they don’t often inhabit. The trail narrowed and became single track, there were monarchs flying everywhere! Dozens of them on one flowering bush, but the roost was nowhere to be seen. We got deeper into the forest and looped around a small creek, and there they were, high up into the canopy of the forest, we were just able to make out the masses of monarchs. The sun was hitting the roost but not quite making it to the forest floor so they weren’t moving lower. The trail was extremely narrow and difficult to stand on while staring up, so we focused on the monarchs feeding at ground level. I was amazed that they were in such good condition, the majority of their wings were perfectly intact. As butterflies age, they lose scales and their wings become tattered and frayed. The migratory monarchs, after making such a long journey, one would assume they would be a little beaten up, but they looked like they emerged the day before! Just another part of the mystery! As people started to hike out in large numbers, there was less and less space to stand. It was closing in on noon and the butterflies weren’t moving any lower so we decided to start hiking out. I was really happy with the trip, it was a fantastic experience, that I doubt will be topped anytime soon. I was especially glad that we visited the two different sanctuaries because each one offered widely different encounters with the monarchs. 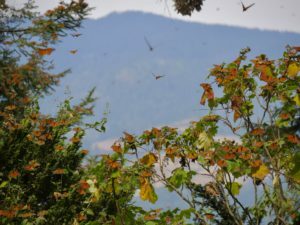 El Rosario was intense because of the sheer mass of butterflies that were right in front of our eyes, we were able to see them flying by the million, but the atmosphere was more groomed and controlled. Sierra Chincua was unique by the hike being spectacular, with views that stunned at every turn. The butterflies may have been high up and unable to photograph, but through binoculars was an equally unique experience. At Sierra Chincua, you were able to photograph the monarchs up close, because there were so many that broke away form the roosts and stayed amongst the wildflowers. That was very rewarding. The pictures are just to die for!